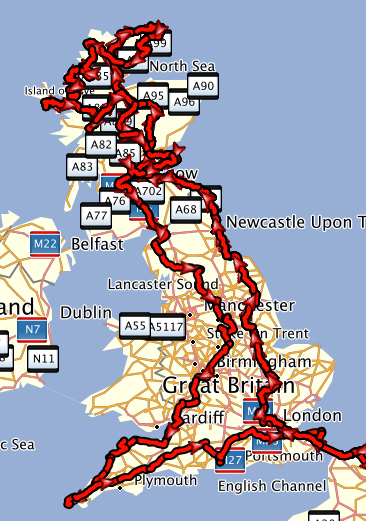 We thought to summarize our visit to the UK since we spent there 8 weeks and rode about 5500km. First of all - the traveling to and from UK. We checked ferries and the train. In the end we went with DFDS from Calais to Dover. It is an 1.5h journey, the fastest ferry connection we could get (Dunkerque-Dover is about 2h). The sidecar costed with the three dogs 109GBP, the solobike 29GBP. We could not do the booking online since the program did not allow the combination of sidecar and travelling with pets. Instead we used the phone and later internet chat. The train would have been much more expensive as the sidecar is charged like a car and at that time they charged 30GBP/dog! The journey was swift and smooth. The only bad thing was that in the car deck there were horrible noises and the car alarms went on regularly (what we could hear during boarding and embarkation). Our girls got a thorough check at the check-in e.g., chip numbers, vaccinations. The arrival in UK was very easy and a few minutes later we were good to go. On the way out of UK we decided to go again with DFDS. It was the cheapest as dogs traveled for free when going out of the UK and the sidecar cost "only" 34GBP. Nobody checked the dogs when we checked-in - we got our sticker "pets in vehicle" and that was it. There was also no customs check on the French border for us. Left-side traffic was not a problem anymore for us since we've been motorbiking already in AUS and NZ. England was totally boring from riding point of view. Roundabout after roundabout after village after village and some more roundabouts besides fields full of sheep... So it's either very slow average speed or highway/motorway. In both cases you don't get to enjoy too much scenery because the small streets have up to 4m high bush-fences on both sides of the street (often felt like riding in a tube/channel) and highways are typically anyway boring. We were shocked to see how badly the surroundings of important street signs were taken care of! Too often hidden by bushes and branches, and Wolfi had quite some trouble to navigate. Haven't experienced such in any other country so far. Ilta though UK would be very friendly towards dogs (and other pets) because of all the RSPCS etc. -programs shown in Finland. Unfortunately she got a bit disappointed... First of all there is huge amount of "No Dog Poop"-signs everywhere (with fines up to 1000GBP! ), but then the streets, parks, forests and beaches are full of human waste! (with no fine?) So the dogs really aren't the biggest problem, but for some reason people are just heavily focused on them... this was somehow bit sad :( Naturally we cleaned after our dogs and ourselves, because it's the responsible thing to do!!! Finding dog friendly accommodations can be very difficult and we don't recommend to do it after a long ride and extremely tired! :D You will just loose your nerves! So first of all many places don't take dog customers at all and if they do the costs might be very high and ridiculous like 20 GBP/dog/night! Unbelievable! We understand that one has to pay the final cleaning, but what is this nightly payment about?! At least we haven't got daily service when being in one place for several days, because of the dogs in the room! These things aren't specific to UK, but the prices were the highest we've seen so far. To be vegan in Britain is rather simple. Bigger cities have plenty of vegan/vegetarian restaurants and shops. The biggest store chains have pretty nice "Free From"-sections, which have also plenty of vegan foods and goodies. For Ilta the biggest disgust was how almost all the veggies and fruits are packed in plastic, especially the organic ones!!! So to find loose organic veggies and fruits was almost impossible. Very sad and non-ecological! In Finland and in middle Europe it's very easy to find seasonal markets to get fresh and loose veggies, but unfortunately this sort of thing we only found in the few Whole Foods markets in Britain. Either that sort of culture is very small in Britain or the markets are very well hidden from normal tourists..? The main reason why we went to Britain and especially to Scotland was because of the "famous" landscapes. We had heard plenty of praising words from other bikers and seen beautiful pictures in films and TV-programs. Unfortunately we have to admit that we got heavily disappointed! 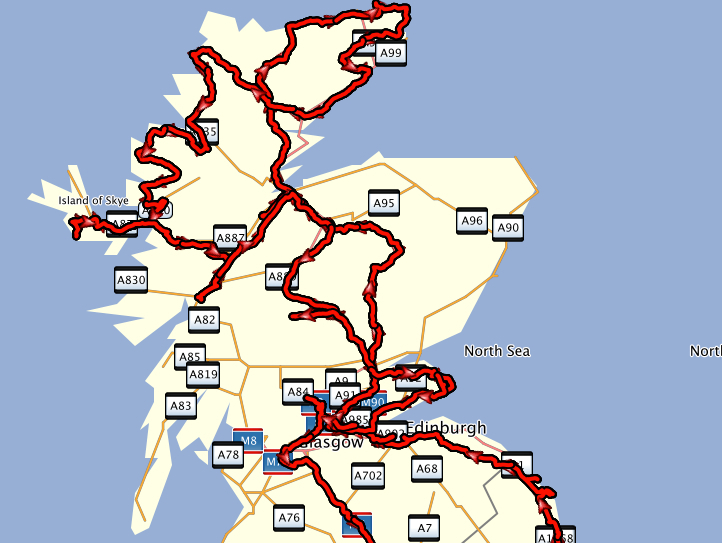 Yes, Scotland has some very spectacular mountains, lochs, seasides and "must-do"-tourist attractions. The things is just, that as an ethical vegan many of the scenes lost their spectacularness very quickly, because we know why they look the way they do... For example the mountains look so cool and barren because humans have cut down the forests to make space for horrible amount of sheep! So in the end we just saw plenty of raped nature and it made us very sad :( Not to mention what eventually happens to those millions of sheep! Of course one always compares things to what one has had or experienced earlier and we've already been biking in Lappland, Alps, Australia and New Zealand. Compared to those places Scotland wasn't anything special. Ilta thinks even Lappland is ten times better place to go biking, because of all the great sand streets and truly wild unfenced nature! England didn't have much nice views for us at all. Plenty of cut down forests, fields, towns, high bush fences and very strange national parks... We drove through many national parks and still don't understand with what criteria they got the name? All the parks looked exactly the same as the rest of the country side: cut down forests and plenty of farms with huge amount of sheep and cattle. We just didn't understand this! Maybe someone can explain us what is the big difference between normal countryside and national park in Britain..? I am from Scotland and I agree with your comments. We all must not believe the shite told about other countries. England as you say is boring. Scotland is wet.